Tony Scheffler didn’t finish Sunday’s game at Green Bay after he took a hit to the head from Packers’ safety Jerron McMillan. It was revealed on the Lions' Wednesday injury report that Scheffler suffers from a concussion which is the third for the Detroit Lions’ tight end. He did not practice on Wednesday. McMillan was fined $15,000 for the shoulder hit to the head of Scheffler, according to FOXSportsWisconsin.com. He was penalized for unnecessary roughness after the completed catch by Scheffler. In his Monday press conference, coach Jim Schwartz was asked about Scheffler’s injury because he didn’t finish the game. Schwartz offered no specifics, but said he could have re-entered the game. It’s not uncommon for concussion symptoms to show up hours or days after a hit. 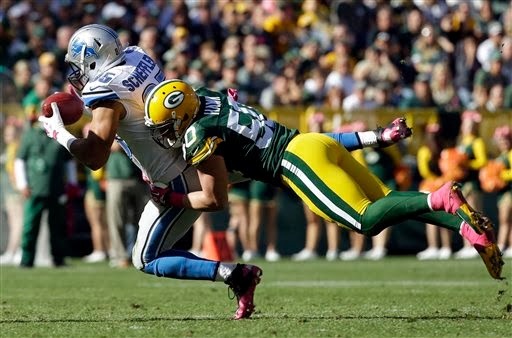 It’s the second fine for McMillan, the Packers’ safety who is in his second NFL season. He will appeal. He was fined $21,000 last season for a late hit per the same web site.